Who would have thought, two decades ago… that I would be making a dress for a dear friend? I met Kelley in high school as a Philly transplant to a totally different county. Transitioning to a new school is always rough, especially Sophmore year! Needless to say Kelley and her friends were all pretty cool and welcoming. We have the kind of friendship that picks up where it left off. It is funny how life kinda brings certain people back into your life. We reconnected just a few years ago and Kelley has shown great support for me and my small business with client referrals and just being a cheerleader for the brand. Like I do with most of my engaged friends… I harassed Kelley until she gave in to me swaying her to allow me make her dress. I am pretty sure she is happy I did… After looking around she just couldn’t find what she was looking for. Kelley sent me a few photos of what she wanted, and I offered a sketch. She immediately said Yes! And so it began. We met for her sample fitting where we finalized the fabric choice of green. Yes, green! Kelley gave me full fabric freedom and allowed me to make the selection. 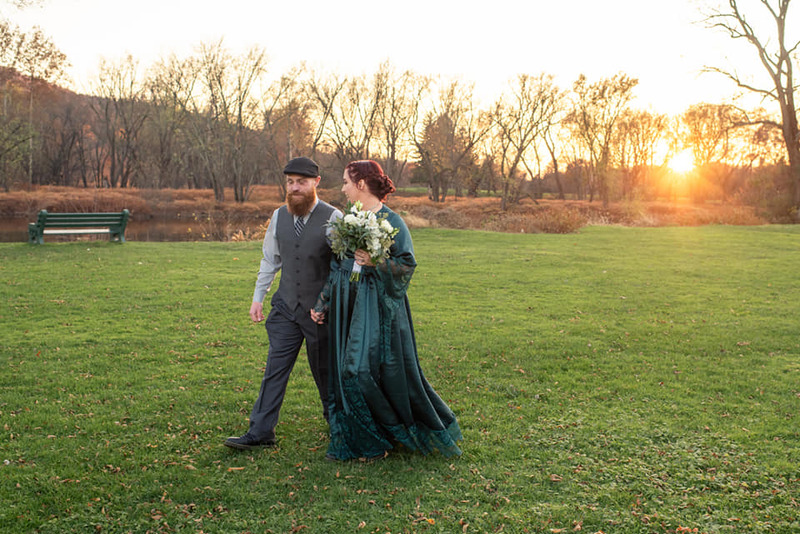 We decided on a beautiful hunter green in a silky charmeuse with matching eyelash lace. I am obsessed with this dress! The bodice overlaps to look like a wrap style dress, with wide band and full gathered circle skirt. The hem of the skirt has 16 total panels with strategically pieced lace and charmeuse. Ooh… did someone say pockets? There are side seam pockets hidden in the skirt. The bell sleeves are also paneled. I hand trimmed the scallops to extenuate the eyelash lace. I topped off the look with a wide belt to tie at the front. I love this non-traditional wedding dress. It is prefect for Kelley!